Summary: "Zoe Ardelay receives astonishing and unwelcome news: she has been chosen to become the king's fifth wife. Forced to go to the royal city, she manages to slip away and hide on the shores of the mighty river. It's there that Zoe realizes she is a coru prime ruled by the elemental sign of water. She must return to the palace, not as an unwilling bride for the king, but a woman with power in her own right. But as Zoe unlocks more of the mysteries of her blood—and the secrets of the royal family—she must decide how to use her great power to rise above the deceptions and intrigue of the royal court." Anyway, the book. The story follows a girl, Zoe, who is coru, ruled by the elemental sign of water. This means that she has a certain proclivity towards adaptability, resilience, change, unpredictability, and other aquatic traits. And Zoe certainly was unpredictable. That was one of the reasons I enjoyed the novel so much, I never had any idea what she would do next. Zoe is intelligent and elementally powerful, but hardly ambitious. She's obviously an introvert; every time she bemoaned her fate at having to attend a grand party at the palace filled with dozens of people she didn't know I wanted to fist-bump her and say, "I HEAR YA, GIRLFRIEND." Zoe has her faults - her flexible nature makes her a bit flighty and unreliable, and she tends to make decisions based on impulse rather than calculation - but on the whole I liked her. I felt that the novel as a whole shared many of Zoe's characteristics: it flowed from one page to the next in a smooth but unpredictable way, keeping me guessing and entertained when I guessed wrong. But it also seemed to be anchorless at times, and I wished the plot was more tightly designed, rather than running from scene to scene in a leisurely and sometimes inconsequential way. I also wish some of the characters were a little less caricature, displaying more than one or two personality traits at most. Zoe felt much more fully realized than many other characters, which I was grateful for since I spent the entirety of the novel in her head. There were too many things to enjoy to let that keep me down for long, though. I loved the verbal sparring between characters. Excellent world building. The culture, economy, politics, religion, history, and even fashion were well thought out and finely portrayed on paper. I felt I had a solid grasp on this tenuous kingdom and on Zoe's place in it. I know some didn't like how strongly the elements were used in the story, but I thought it was so integral to the characters and their culture that it had to be so prominent. All in all, I very much enjoyed the story and would definitely recommend it to YA lovers. I can't wait for the sequel, which is coming out November 5th!!! I've already got it on hold at the library. One last note: Someone please tell me what to think about this cover. On the one hand, I like that her attire alludes to the Arab influences in the novel. But the cover as a whole just reads so blah to me. I know it's YA, but something about it feels too juvenile. I wish I could copy and paste the cover of Jhumpa Lahiri's Unaccustomed Earth to this book. It would be so much better. Yes? Yes. Cover = blah. 10 points for Gryffindor. PS- Pottermore actually told me I was in Ravenclaw, which I was not expecting at all. Mind=blown. I love that you are doing a book blog! 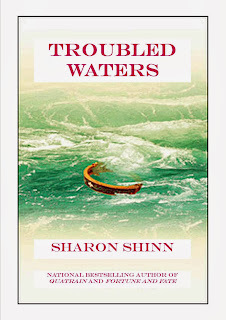 I also really enjoyed Troubled Waters. 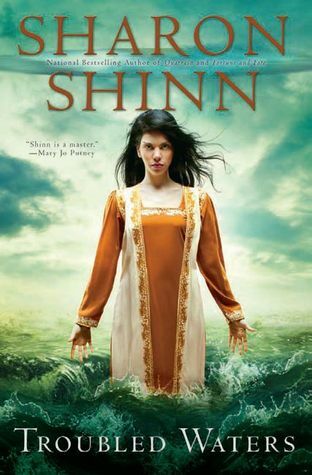 It was the first Sharon Shinn book I read, and now she is one of my favorite authors. I especially appreciate the importance of religion in many of her novels. I already have Royal Airs on hold at the library! You should try the Archangel series she wrote. It has science, religion, angels, and music! Hi Cheryl! Thanks for stopping by! Come on over to Bookmark Dragon anytime, I'd love to hear your insights around here. 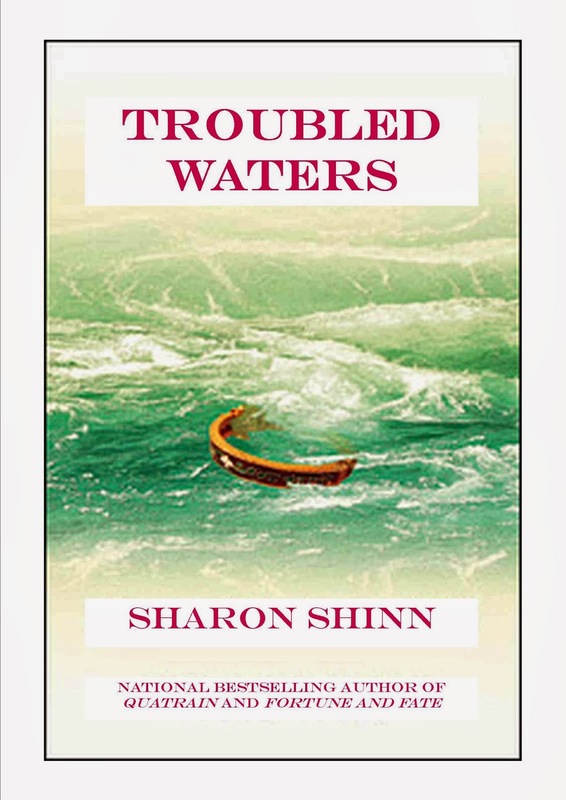 This was my first Sharon Shinn novel too, and I am also an immediate fan. It seems that many authors just skip over religion in their world building, since it can sometimes be a sticky subject. But religion/spirituality is an integral part of every culture, and I wish it wasn't ignored as much as it is. I thought this book did a good job of including religion in the story without making the story overly religious. Rae Carson's "Girl of Fire and Thorns" series also does a good job of that. Do you know of others that also fit this category? I can't wait for Royal Airs, and will definitely be checking out Shinn's Archangel series. Thanks for the recommendation! Okay Mel. I read this in like a day and a half. I LOVED it. LOVED IT. I'll post more thoughts on goodreads soon but I am so glad you recommended this one. I also would love to read a novel where the "love interest" is not conveniently introduced in the first ten pages... or read a novel where the love interest is not initially despised... but that is another rant altogether. Oh, and I am not even surprised to hear you are a Ravenclaw. Totes could have guessed that. Gah!! So glad you read this one!!!! I loved this one too. WE MUST TALK SOON. But you should probably hurry and read Royal Airs just so that we're on the same page when we get together and squeal about Sharon Shinn. Yeah, the one-parent/no-parent thing is pretty prevalent in YA lit, isn't it? I just thought back to the last few YA books I've read, since you brought it up, and I think that one-parent or no-parent thing is the case for ALL of them. I think one of the reasons for this is because YA books often portray the protagonist's journey to becoming independent, which obviously includes becoming independent of their parents as well, and therefore purposefully excludes parents from the story. Another reason is because I think authors want to show teens how to solve their own problems, make mistakes, and learn from them. This doesn't necessitate the demise of parents, but it does make parents largely inconsequential. I think the biggest reason for this trend, though, is that these books are made and marketed to teens, and teens don't want to read about parents, they want to read about teens. And the market delivers. What do you think?